Recently, it was Rav Avigdor Miller’s, zt”l, zy”a, eighth yahrzeit. Mishpacha Magazine interviewed Rav Simcha Bunim Cohen, who married Rav Miller’s granddaughter. The interview so moved me that I would like to elaborate on some of his wonderful points. Rav Cohen revealed that in Rav Miller, he found a Rebbe who taught him the ABCs of Torah Yiddishkeit. A: to thank Hashem; B: to ask of Hashem; and C: to live with Hashem. I’d like to develop these three themes. Let me preface this by saying that Rav Miller once said that whoever listens to one hundred of his tapes can consider himself an idealist. I had listened to one hundred of Rav Miller’s tapes already in the 1970s and would like to share with you - from his knowledge - some of the pearls of his wisdom that he mentioned about the above topics. 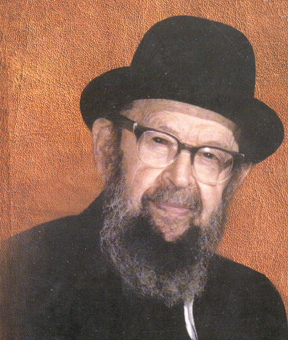 Rav Cohen reminisced that it was difficult to find time to get close to his holy Zeidy. After all, Rav Miller gave forty shiurim weekly and was learning and preparing every minute of the day and night. I remember vividly that about twenty years ago, I had a weighty question to ask Rav Miller and I made an appointment with him. He graciously gave me about four minutes in the tiny hallway at the foot of the steps leading to his apartment. I heard from Rav Mannes Mandel, zt”l, zy”a, Dean of the Yeshiva of Brooklyn, that he had a similar experience with Rav Miller, for Rav Miller did not have time to invite people upstairs for a cup of tea. He was always learning! So, Rav Cohen relates that by one of the chasanas of R. Miller’s grandchildren, he approached his grandfather with a list of questions. Rav Miller asked him whether they were urgent, and when he replied no, Rav Miller said, “Then, let’s save it for another time. I have a sedar at my grandchildren’s chasanas. I thank Hashem that all of my descendents are shomer Torah and mitzvahs. Imagine how many people waste time at family weddings quibbling over kibudim, the doling out of the benedictory honors, or whether the band is playing the right music, or disputing seating arrangements. Rav Miller apprises us of the fact that at highlights in people’s life, they should be mindful to thank Hashem. Rav Cohen then told another fascinating story. Once, Rav Miller was walking in the street and met his daughter. He said to her, “Boruch Hashem, that you are married.” She responded in bewilderment, “Papa, I’ve been married already for twenty years,” and Rav Miller replied, “Yes, and I thank Hashem for this every day.” This was a constant lesson that he taught us from the sage advice of the Chovos HaLevovos, one of his very favorite seforim, “Devorim she’rotze lehasmid boh, al tiftach boh - Things that you want to continue, do not take them for granted.” Thus, if all of your children are happy and productive in yeshiva, don’t take this for granted. How many families suffer with children who are rebellious, anorexic, who become to their parents’ consternation chain smokers, gamblers, or even worse. If there is no screaming in your house, don’t take it for granted. In all too many homes, there is rarely a quiet night. He would say that we are all familiar with the conclusion of Ashrei, “Korov Hashem l’chol kor’ov, l’chol asher yikra’uhu b’emes - Hashem is close to all those who call Him; to all those who call Him in truth.” He further explained this means that the best way to call Hashem is in truth, rather than in need. That the preferable mode of prayer is what is taught to us in Masechtas Berachos, “Al zos yispallel kol chosid, l’eis mt’zo - For this every pious person prays towards the time of finding.” The Gemora has a variety of explanations as to what the time of finding refers to. One explanation is that it refers to finding a mate, for the posuk refers to a spouse as a “find,” as in the verse, “Motza isha, motza tov - One who finds a wife finds that which is good.” Rav Miller would urge people that it is never too early to pray that, in the proper time, one’s children should find their proper basherta, quickly and easily. Another explanation that the Gemora gives for a time of finding is praying to find Torah knowledge, which is also considered a find as in the verse, “Ki motza’ie matza chaim - Those that find me (Torah) find life.” Thus, one should pray to always have good Torah teachers and study partners and one should also pray to enjoy one’s Torah learning, as we say in the vital prayer, “V’harev na Hashem Elokeinu es divrei Sorosecha b’finu - Please, Hashem, make sweet the words of Your Torah in our mouths.” This prayer is so important for our descendants as well, for one of the primary reasons why adolescents fall off the track is because they don’t get this kind of satisfaction and fulfillment from their Torah studies. Also, included in this blessing is the request to have the financial means to be able to concentrate on one’s studies without the distraction of economic worries. Finally, also included is the long-term prayer that as we grow older our memories should not fade nor should our concentration lose its sharpness. The Gemora then caps this emphasis on praying in anticipation with a very drastic example. It teaches us that we should pray that even upon our demise we should have an easy exit from this world. Death is also called a find, as in the verse, “L’maves toza’os - Issues of death.” The Gemora teaches us that there are 903 different ways to die, the gematria of the word ‘toza’os.’ A person should occasionally pray that when it comes their time, they should leave the world in a pleasant way and not from a debilitating disease or agonizing dementia, or a catastrophic suddenness that would deprive us of the ability to instruct our families and make final amends to Hashem and to our loved ones. Rather, we should ask Hashem for the blessing of hoary old age like Avraham, our Forefather. Such a practice will go a long way toward training us how far ahead we should look when we petition Hashem for our needs. It is human nature not to worry about problems that we are not experiencing. But, the Gemora is teaching us that we should pray not to get osteoporosis, not to experience hardening of the arteries. We should ask Hashem that we should have, even in our old age, use of our own teeth and not need the hardships of dentures. We should beseech Hashem that as we grow older we should retain our sight and our hearing. In the same way, we should plead with Hashem that we should not lose our sense of equilibrium. This is all a part of mature prayer. In the merit of our following Rav Miller’s sage advice, may his neshamah have an aliya, may he be a meilitz yosher for all of us, to intercede in our behalf that we have long life, good health, and everything wonderful. Sheldon Zeitlin transcribes Rabbi Weiss’ articles. If you wish to receive Rabbi Weiss’ articles by email, please send a note to ZeitlinShelley@aol.com. ©2008 http://campaignpublishing.com - Publishing pages and pages to the web.